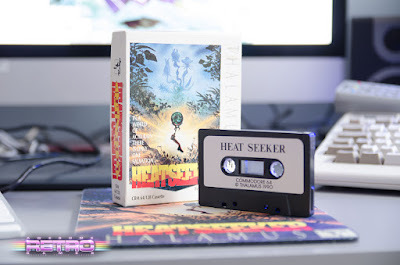 Awesome Retro Games: Heatseeker by Thalamus!!! Finally after months and months of searching I have a copy of Heatseeker by Thalamus in my hands! I know it's not the best game in the world but as a kid I was always intrigued by the artwork in Zzap!64 and Commodore magazines back in the day. The ancient land of Trantis. Legend has it that the Triphyllos of Nem, three mysterious and magical plant, their petals forever open, hold in their lifeblood the entire race memory and physic of the people if Trantis. Should their lifeblood ever corrupt, doom would follow. All the people would surrender to plague and death. The legends have lost their meaning, civilisation is heavily industrialised and sprees its filth in a blanket of pollution over the land. Even the pure cleansing power of rain ahas been converted to acid poison. And at the very heart of Transit the Triphyllos shut off. And yet in this soulless modern world there is hope: The Gnostics, a wise and secretive race, forgotten by all but a few, seeing their lands in peril have constructed the Leg. Where man cannot go safely a machine may trespass unharmed: the Leg is an acid resistant heat probe designed to enter the most polluted of areas and absorb the heat of the Zeal smog flames. Remote-controlled by one of the Gnostics the Leg must explore the heartlands of Transits twice - once by day then by night. Then, on Midsummer's Eve, the robot must approach the Triphyllos of Nem and send out its probe to relinquish its stored heat to their lifeblood to revitalise the plants and give them strength to open their petals and resume their beneficent influence - thus restoring sense to the people of Trantis! But then in a world of acid rain the only hope of salvation lies with the Heatseeker! Commodore 128 RetroBrite and 6581 replacement. All photos are taken by myself and there for subject to copyright ©DerekJohnstonPhotography . Powered by Blogger.